Terex Finlay’s new 873 screener ... heavy duty. Terex Finlay has launched the new 873 tracked mobile heavy-duty screener, designed to work after a primary crusher or on its own as frontline screening machine. This highly versatile and adaptable machine is suitable for working in quarrying, mining, construction and demolition debris, topsoil, recycling, sand, gravel, coal and aggregate applications. “This aggressive forward-facing inclined modular configuration screenbox has a 3.66 by 1.52 m top deck and a 3.66 by 1.52 m bottom deck, giving a total screening area of 14.4 sq m,” says a spokesman for Terex Finlay, a global leader in design and manufacture of mobile crushing, screening and recycling solutions. The banana profile and increased area of the new bottom deck maximises screening of fines material. Depending on the working application of the machine, hydraulic adjustment can be used to vary the angle of the screen box between 13 and 19 degrees. The top deck of the screenbox can be fitted with a variety of screening media including tines, bofor bars, punched plate and mesh. The bottom deck can be fitted with mesh or cascade fingers. The screenbox discharge end can be hydraulically raised 500 mm to facilitate efficient and easy media access and changing. 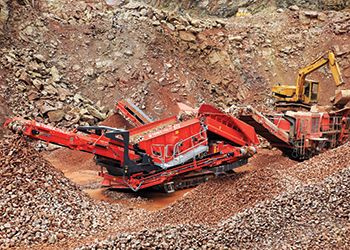 The hopper has a 7-cu-m capacity as standard with a drop rear door for use in conjunction with a mobile crusher. The machine is equipped with three hydraulically folding discharge conveyors, allowing for maximum stockpiling capacity and associated benefits of rapid set-up and teardown times. Additional features of the machine include galvanised access ladders and catwalks fitted as standard to both sides of the screenbox. Hydraulic raising of the screenbox discharge end provides additional clearance for the screenbox and fines transfer conveyor maintenance. Oversize conveyor can be hydraulically adjusted from 18 to 24 degrees. Terex Finlay have been manufacturing a comprehensive range of tracked mobile crushing, screening and recycling equipment for over 50 years. A global pioneer in tracked mobile solutions, the company offers a comprehensive range of equipment to the quarrying, mining, construction, demolition and recycling industries. Its range of innovative machines are manufactured to provide efficient production, low operational costs and ease of maintenance.